When I first opened my business, one of my first custom dressmaking clients was a young woman named Hillary. At the time, she was interested in having a specific dress made for her, and I was one of a number of Etsy artisans who responded to her custom item request. Because we were local to one another, and I could meet with her for fittings, Hillary chose to work with me. We loved working together, and have continued to do so in the time since! Hillary has a very well defined sense of personal style. At the same time, modesty is an important expression of her faith. She does not care to sacrifice either of these things for the other, and so in addition to the custom designs we have made together, Hillary has also brought me ready-to-wear clothes to alter. We let out hems or add ruffles to lengthen skirts as needed; we add darts to tailor clothes that are not only modest but also shapeless and unflattering. The result is a polished wardrobe that always reminds me of what I’d expect a young professional of the late 50’s or early 60’s to wear – impeccably tailored and well cared for, feminine, at times understated, of course figure flattering and always demure. At the same time, she often incorporates modern elements, and frequently she makes use of architectural elements like collars, cuffs, belts, and big buttons. I adore her taste. Our second project together was Hillary's own design! And so for years I have looked forward to the day when she would eventually marry. I knew she would want a custom gown; I could not imagine anything off-the-rack satisfying all her requirements. During our first project together, I let her know I’d be happy to be the one to make her gown when the time came. When the love of her life proposed to her, Hillary tells me I was the first person she emailed! (After, of course, phone calls were made to all the family). Our third custom project together, a silk Dupioni little black dress. I had dozens of ideas before we began to speak about her dress. So many, in fact, that it was hard to know where to begin. She’s slender with an hourglass figure, and pretty much any silhouette, properly tailored, could flatter her. Her taste draws on both vintage and modern elements. I knew she’d want a more traditional gown than some of my other brides, but I imagined she’d want some surprises too. We scheduled a design consultation, and I tried to keep an open mind for the right inspiration to find us. Thankfully, open minds and a number of conversations lead us to something simply perfect. Up next: the inspiration we drew on! Early on in our custom design process, I let Rachel know that if she was interested I could custom make her veil to coordinate with her gown. She was delighted with the possibility but had no ideas about what specifically she would want. I think our mutual friend Ann-Michelle was the first to suggest she consider a fascinator instead of the traditional veil. As soon as we began thinking on that track it was clearly the right call for Rachel and her wedding day. Again we perused the internet for inspiration. Rachel liked the look of a couple of photos with flower fascinators that had wispy feathers sort of sweeping out around them. On a shopping trip together to find flowers for the gown, we found some feathers dyed a deep purpley magenta that were just perfect! 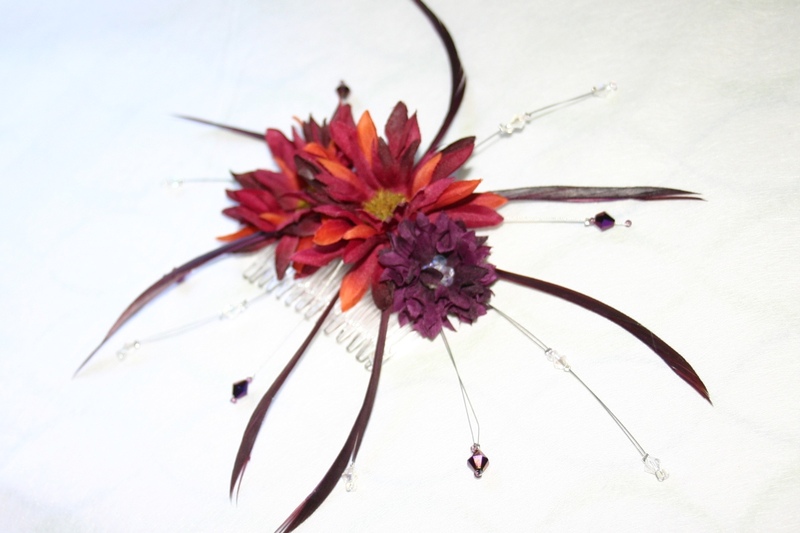 These, together with flowers Rachel selected to match the bouquet she would carry, and some stunning iridescent beads that matched the Dupioni exactly, came together to make a beautiful accessory for her hair, that coordinated wonderfully with her gown. Springtime is rapidly approaching, so perhaps it’s no wonder that I have recently received a flurry of requests for custom made bridal veils. I simply love getting to work on these hand crafted veils! They are enjoyable to make and my brides are delighted with the result. 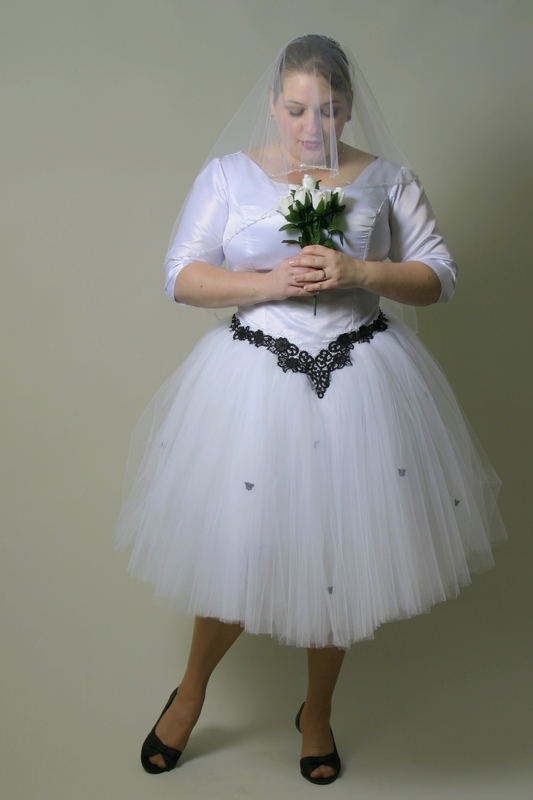 This is a perfect example of the benefits of contacting a custom dressmaker. 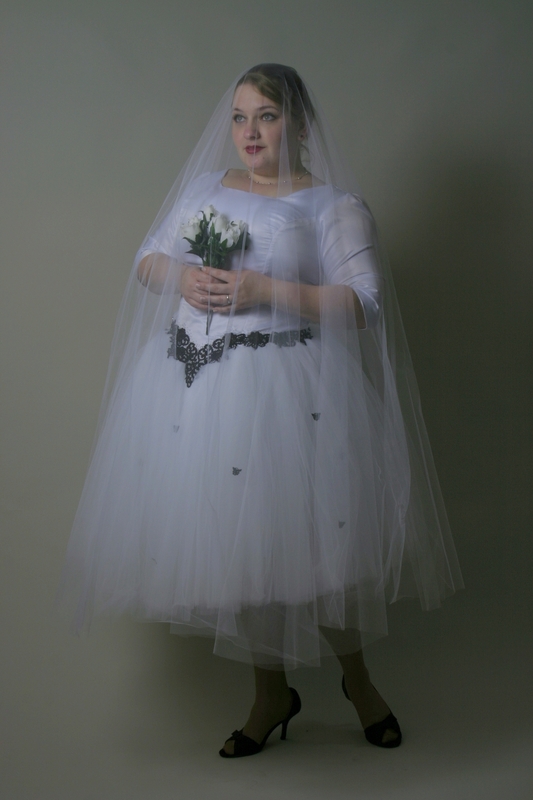 I am easily able to make veils in just the right length, color, and fabric, and adorned in whatever way will best compliment the bride’s gown and personality. This could be anything from a simple cut edge to freshwater pearls hand sewn along the edge to stunning imported Alencon lace. Meanwhile, the custom selected fabrics and lengths assure the veil will match the bride’s gown, hairstyle, and personal preference. And, in most cases, my pricing comes in dramatically below those charged by bridal boutiques for off-the-rack veils! The veil pictured to the right is one of the current listings in my etsy shop, and the photos below showcase some of the different styles of edges on the custom veils my recent clients have requested. I have a deep love of 1950’s fashion that dates back to my childhood days, watching old reruns of black and white sitcoms. I still adore Laura Petrie. So, I recently decided to design and sew a 50’s inspired bridal gown to list in my etsy shop. It was so much fun to make! And fun to model too. 🙂 Enjoy! 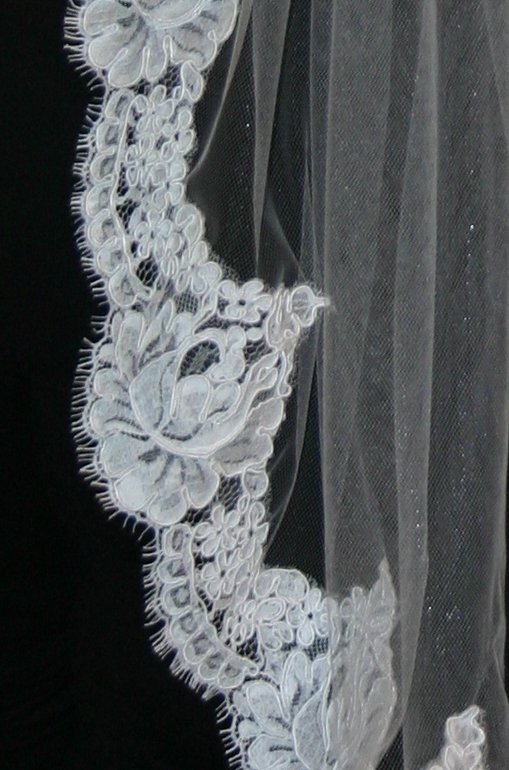 This beautiful veil was custom made for a client on etsy to match her bridal gown. 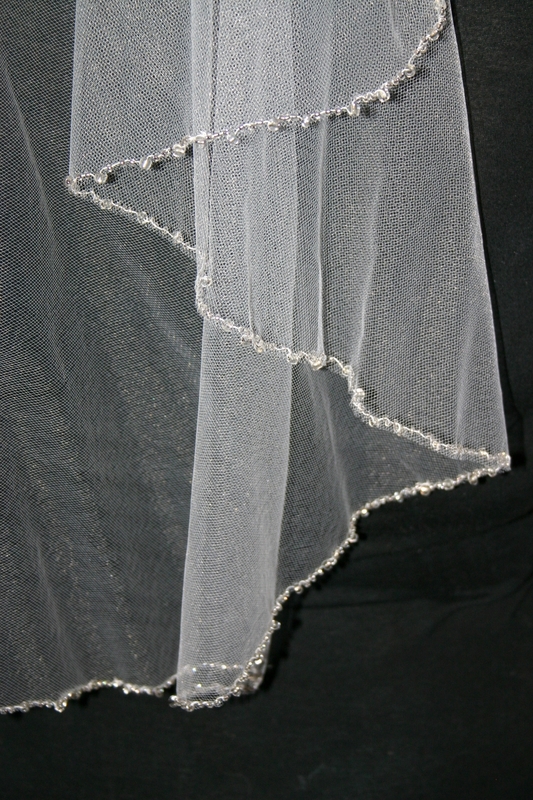 The mantilla style veil has an offset comb to fall over her face as well as down her back. The veil is made from ivory colored bridal illusion tulle, and the entire edge was hand beaded with beautiful Swarovski bicone crystal beads, real freshwater pearls, and sparkling sequins to match her gown. Previously, I posted pictures from our bridal photo shoot showing off the two bridal veils I listed in my etsy shop (the beaded one sold already! ), but I wanted to give a few details today about the gown itself, which is also available now. Simple elegance and feminine beauty grace the bride wearing this beautiful gown. 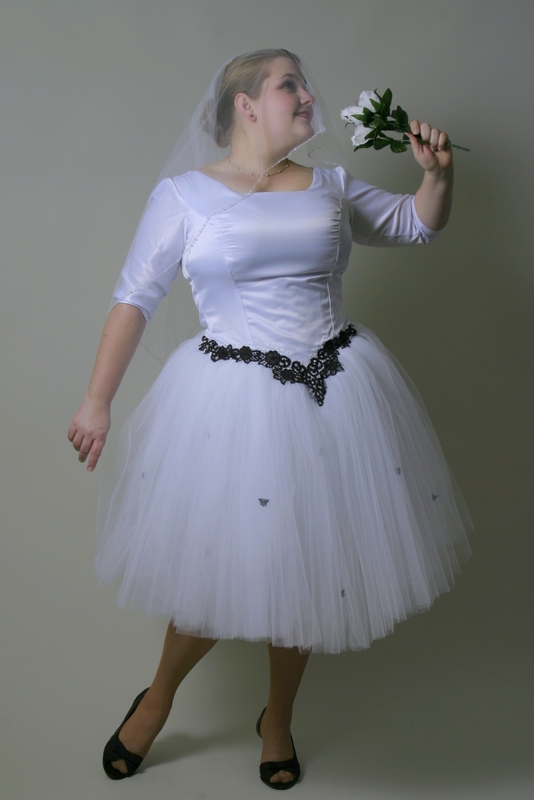 This dress is made from a splendid white Lamour Satin with a sweetheart neckline that sparkles with Swarovski rhinestones in Crystal AB and hand sewn glass beads. The strapless bodice has a self fabric facing with boning and sewn in bra cups for a secure fit and a beautiful feminine shape. The bodice flows smoothly into an A line skirt that ends in a chapel train. The entire gown is self lined with a second layer of satin, and it closes with an invisible zipper in the back. The dress shown here is available in my etsy shop for immediate purchase! 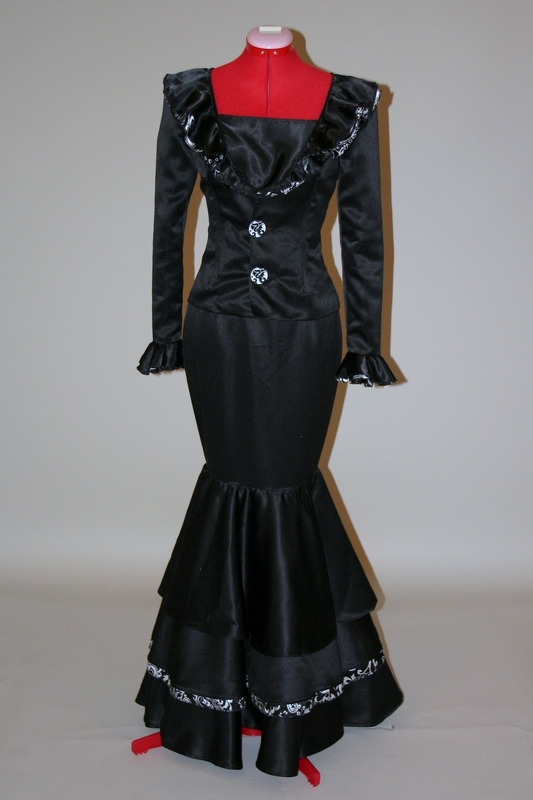 I am also taking orders for custom bridal and formal gowns at this time. I’m really intrigued by some of the smaller, less extensive options that have been popping up for brides to wear on their wedding day. Options that compliment an updo and allow a bride to show off the detail work on the back of her dress. Others that have strong vintage influences, like birdcage veils with fascinators or even pill caps that look like they’re straight from the 40’s or 50’s. Veils that are lovely but understated, flattering the bride without stealing the show. 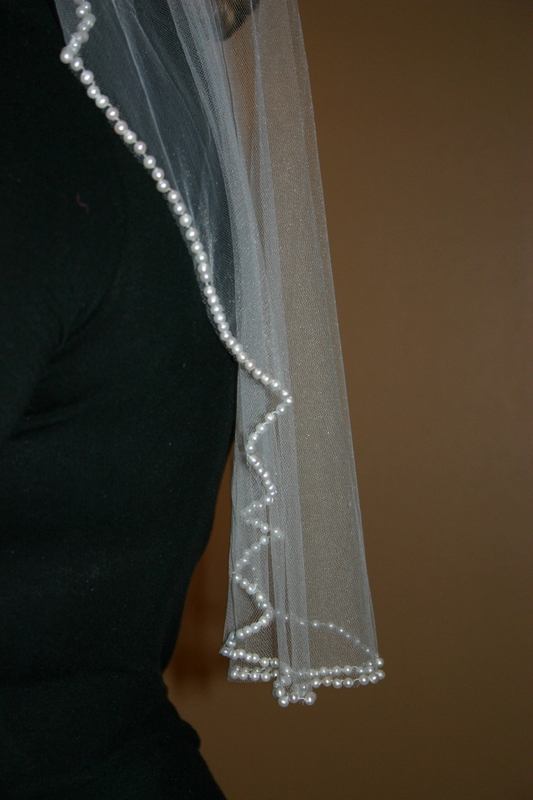 Following the creation of a few other veils recently, I had some smaller pieces of tulle remaining and it seemed like the perfect opportunity to make a petite veil. I added a satin ribbon edge and some rhinestones to dress it up a bit, but ultimately kept the veil simple, sweet, and understated. This veil is for sale in my etsy shop now.